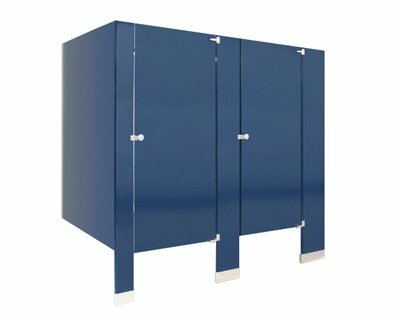 The 30 Series Toilet Partitions are used where no overhead bracing is required, but ceiling hung partitions are impractical. The 30 Series (floor supported) is ideal – modern spaciousness and rigidity are important features. The 30 Series is also featured in a 54″ junior size which has proved to be a great help with young children, which makes it perfect for elementary schools. Fax your layout and zip code to: 1-800-899-2398 and find out how affordable new partitions can be.